February 6, 2017 – This week, in honor of Black History Month, our time machine travels back in time to meet a forgotten American hero in the fight for equality — a hero, with a bicycle. You may never have heard of Marshall “Major” Taylor, but this son of an Indiana Civil War veteran was the most popular athlete in America and heralded throughout the world, back at the height of the Jim Crow era in the early 20th Century. A devout Christian who never touched alcohol (well, okay, once) and turned down massive sums of money because he refused to race on the Sabbath, Major Taylor inspired Americans of all colors, and laid the groundwork not just for superstar athletes on all fields of play. But more than that, he helped pedal the American republic, towards that more perfect union. 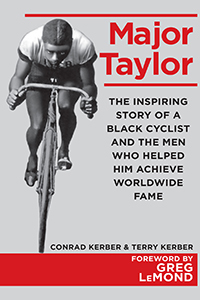 Our guest is Terry Kerber, who along with his brother Conrad co-authored, Major Taylor: The Inspiring Story of a Black Cyclist and the Men Who Helped Him Achieve Worldwide Fame . Check out the Major Taylor Association for more on this inspirational wheelman.